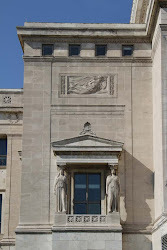 Bequest of Howard Van Doren Shaw..
Galleries of American Art Sculpture Court [Gallery: 161]..
Rice Building - Lower Level.. 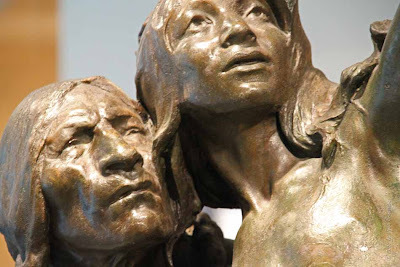 But marker at the Art Institute has the name - The Sun Vow [Modeled-1898, Cast-1901].. There's a very interesting context of this sculpture..click here..
During his visits to several Native American tribes, he [Hermon MacNeil] heard of a rite of passage that captured his imagination: before a boy on the threshold of manhood could be accepted as a warrior of his tribe, he must shoot an arrow directly into the sun. If the chieftain judging the boy's prowess was so blinded by the sun's rays that he could not follow the flight of the arrow, it was said to have gone "out of sight," and the youth had passed the test. MacNeil felt that the story, with its "patriotic ring," lent itself to a group composition. 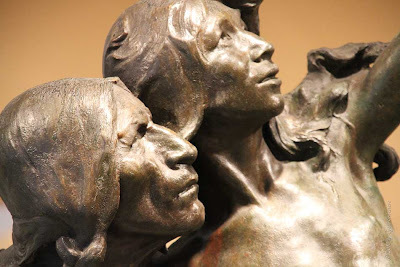 In this bronze work, he portrayed two Native Americans (whom he identified as Sioux) straining to follow the arrow's flight. 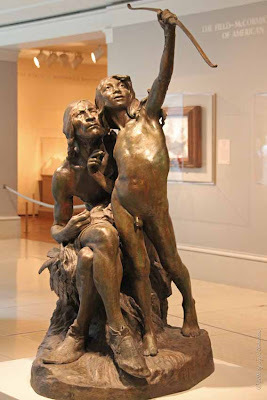 MacNeil heightened the visual impact of his composition by choosing to capture the moment when the arrow has just been released..
McNeil's plaster model for the Sun Vow won a silver medal at the 1900 Paris Exposition Universelle. Chicago architect and Art Institute trustee Howard Van Doren Shaw purchased the first bronze cast of the sculpture in 1901. This sculpture was bequested by Shaw to the Art Institute.